Charred kangaroo loin, served medium rare, with braised golden beetroot, black radish, Davidson plum and rosemary jus. Burleigh locals dine surrounded by vintage sophistication at Ragdoll Dining on James Street. Escape to a new Gold Coast destination, where a range of intimate ambient spaces deliver different options, whether looking for a romantic table for two or a party space for twenty. Chill out with an espresso martini on an elegant leather Chesterfield sofa, while pondering a Mod Oz-infused menu of share platters that will tantalise every tastebud, paired with an extensive wine and cocktail list. 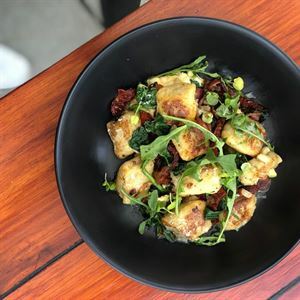 Think dishes like crispy calamari with chilli jam, scallops with saffron and cauliflower puree, prosciutto and dill, or perhaps chipotle pork soft shell tacos, pear and apple slaw. For a decadent finish, don’t go past chocolate tofu parfait, with miso caramel, fresh raspberries and toffee popcorn. Chat to us about your needs .. I'm confident we can meet them! Food, cocktails, atmosphere and staff are all a 10/10. Highly recommend. This brand new venue is a wonderful addition to Burleigh with a wicked cocktail list and wines to please everyone! A must try when in the area!! ?? Excellent venue. The staff are welcoming, friendly, professional and knowledgeable, they made the whole dining experience one to remember. The food is scrumptious and I can't wait to go again to try something else from the menu.